ESCANABA---Bailey Lamb hasn't pitched much this summer for the Escanaba Cubs, and he never pitched at all during the high school baseball season. But on Wednesday night, the soon-to-be junior looked quite comfortable on the mound as he tossed a three-hitter over six innings, handcuffing the Marquette Blues, 3-0, at Al Ness Field. Lamb got six fly balls in the first three innings, and he never allowed a Marquette runner to get past second base in one of Escanaba's best pitching performances of this Legion baseball season. Bailey Lamb threw a three-hitter. "Really, I was just trying to throw strikes," Lamb said. "I have a really good defense behind me. That's my game plan every time I got out there, just try to throw strikes and then let my teammates do all the work for me and I can relax out there." "We needed a game where somebody would throw strikes, and Bailey throws strikes," Cubs Manager Tom Ohman said. "We didn't need walks. We stayed away from that and we played a clean game." That defense wasn't too sharp in the first inning as the Cubs committed two throwing errors. But Lamb struck out Nathan Mutch to get out of that first inning unscathed. "It was the only one ('K') of the day, but I guess it came at a good time," Lamb laughed. Ohman was a bit worried when those two errors happened in the first inning. "We had just spent Monday and Tuesday night breaking everything down fundamentally on ground balls," Ohman said. "We worked them pretty hard on it. Then, when that came about, I was like, 'Oh come on, you've got to be kidding me!' But they rebounded and they played above it. It was our best game of the year." Ben Kleiman gets tagged out trying to steal second base....in the face. The Cubs took a 1-0 lead in the bottom of the first inning when Justyn Doucette led off with a single, got bunted to second by David Falish, and then scored on a throwing error by Marquette shortstop Spencer Larson. Lamb gave up two hits in the second inning to Alex Barker and Ryan Walther, but with two on and two out, Nick Vandermissen made a diving stab of a Riley Lynch shot up the middle. He shoveled it to shortstop Ben Kleiman just in time for the out at second. "That would have probably been a run if it got through," Ohman said. Another good defensive play came in the fourth inning when DeHaan somehow got to a foul pop up behind the plate. He dove, caught it, then held on as he hit then ground. "That was a spectacular play," Ohman said. "Alex has been like that all year. He's the one guy who always has energy and tries to pump everyone up. That was all hustle there." Escanaba scored twice in the fifth inning against Marquette right hander Adam Gannon, and they did it with four straight hits after the first two men were retired. Doucette got it started with his second hit of the game, then Falish singled to put two men on. Vandermissen came through with his second hit of the game, an RBI single that made it 2-0. DeHaan then drove home the second run with a hit to make it 3-0. "That was huge, because I didn't think that we'd be able to hang on to 1-0," Ohman said. "Those were big hits. And given the heat, and the fact that Bailey works at the football field all day, I was thinking that he went a lot farther than I thought he would." Alex DeHaan goes into second after his hit. Ohman pulled the likeable redhead off the mound in the seventh inning. Lamb saw Devin Olsen and Jeff Lyle warming up in the bullpen as he pitched the sixth inning. "I was thinking, well, it was a pretty good day, so if he takes me out, that's all right," Lamb said. "I was getting tired out there and I figured that Coach knew what he was doing. I just wanted to pitch good in that last inning." He did. Lamb retired the side 1-2-3 in the sixth inning, and then Olsen gave up a leadoff single but got the next three outs in the seventh to earn the save. Lamb threw just 65 pitches in tossing a three-hitter over six innings. He walked just two. Doucette had two hits that started both of Escanaba's scoring innings. And he scored two of his team's three runs. Doucette is a 19-year-old who did not play high school or college baseball during the spring, but he has hit well. How did he get ready for Cubs? "Whiffleballs," he said, in all seriousness after the game. "Just a lot of whiffleballs with Kyle (Berres) and Matt (Jensen) and everyone else who stayed here." And Wednesday, he had to do it in the leadoff spot in the batting order, in place of Austin Young, who is missing this week due to an All-Star football camp in Marquette. "I had to 'one-up' Austin," Doucette smiled. "We have a little competition." 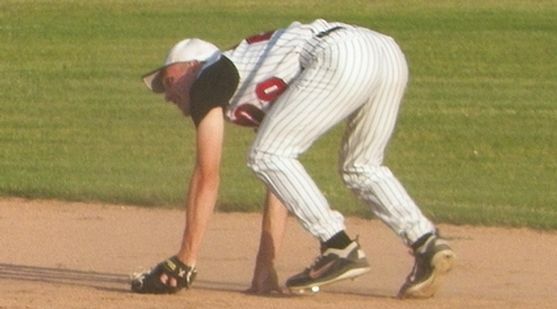 Escanaba (5-6) travels to Kimberly, Wis., for three games in the annual KBO Invitational. The Cubs play Appleton Post 38 Friday at 4:00 (E.T. ), and then Escanaba faces Highland, Ind., at 4 Saturday afternoon and the host Kimberly team at 6:30. Friday's game will not be on the radio, but Saturday's doubleheader will be broadcast live from Sunset Park on WCHT-AM (600) and on-line at www.rrnsports.com. Click the thumbnails in the 'ARTICLE HIGHLIGHTS' box at the top of this page to see more photos and listen to radio replays and interviews. Thanks to Sam Barton for the photos. The top photo on page: Nick Vandermissen traps the ball at second base and robs Marquette of a hit and a run. Justyn Doucette gets one of his two base hits in Wednesday's game against the Marquette Blues.